In case you have not read some of the other articles I’ve published on this web site, I should begin by saying that my son had terrible colic, was diagnosed with severe GERD (Gastroesophageal reflux disease) at 2 month of age, and was diagnosed with a bad milk allergy by his 8th month. At the writing of this article my son is 3.9 years old. About 4 months ago we started put teaspoons of Kefir Cream Cheese in my son’s juice once or twice a day. Kefir Cream Cheese is made by removing much of the whey from Milk Kefir in order to thicken it, concentrate many of its nutrients, and reduce its lactose content. We used such small amounts to both ease him into the taste (which is a little like a sour yogurt) and ease his digestive system into regular dairy consumption. Steadily we increased the content until about 3 weeks ago we started giving his up to 3 ounces of Kefir Cream Cheese mixed with 4 ounces of juice. Lex appropriately calls it “milk juice”. He often requests it throughout the day and I estimate that he consumes up to 7-9 fluid ounces of concentrated Kefir Cream Cheese per day. On his current diet of Milk Kefir Lex can now eat any quantity of and variety of cheese without any digestive issues. Three years ago, the smallest trace of any dairy product gave him endless diarrhea. We no longer give him daily does of Culterelle Probiotics. We expect that 20+ friendly bacteria strains in Milk Kefir are more than enough for our son. Honestly, Lex is the most regular that he has ever been. Perhaps coincidentally we were able to reduce his GERD PPI medicine by half for the first time after after Lex was taking Kefir for two months. This was totally unexpected after so many previous failed attempts. I can’t help bu think there is a connection between this wonder food and the improvement in his reflux. We recently went on a cruise and for some very foolish reason we did not take any Milk Kefir or Kefir Cream Cheese; we took some Soy Milk instead. Bad idea. Firstly he would barely drink it. Secondly, although we resumed giving him 1 capsule of Culterelle probiotics each day, Lex developed a bad case of diarrhea. We are almost certain it came from all of the cheese and deserts that we let him eat while on the cruise. When we cut off the cheese and dairy-containing desserts Lex returned to normal. I am almost certain that if we had been giving him Kefir Cream Cheese as regularly as we do at home that he would not have had any digestive problems. Needless to say, when we got home we were all happy for him to get back on his super probiotic-fortified milk Kefir. I was skeptical of Milk Kefir and all of the miraculous claims that my wife told me about, but after what I have witnessed I now cannot deny that it has helped my son greatly. He likes the flavor and I know that he loves the ability to eat regular cheese and even regular ice cream without getting diarrhea or bad gas. Even I feel better when regularly eating it and it has lowered my wife’s cholesterol as well! Has it cured my son’s Milk Allergy? No, but it is treating it, or rather it is controlling it and permitting him to eat, within reason, as all of his other friends do without any concerns. We don’t even tell others that he has a milk allergy anymore and we don’t worry about him being offered or finding dairy products. We now give Lex just about 1/3 cup of straight milk kefir mixed with about 3/4 cup of 100% fruit juice. He seems to like it and it mixes more smoothly. He seems even more regular now than before and more importantly he seems to have no trouble with the occasional ice cream or chocolate milk. We still add KAL Crystal Calcium to the “shake” and also supplement every other day with those Calcium Gummy Bears. Thanks for the enlightining article. My son who is 18 months now has also been diagonised with milk and egg whites allergy. Since then I have been reseaching on how to help him build his immunity to the various diary products. Reading your article on introducing Milk Keir has increased my confidence and I think I would also like to give this a try. I had bought a kefir smoothie last week from my regular grocers and tried giving him a few sips. Though, he loved the taste, I saw that he developed some small red rashes on his cheek ( which is his way of showing his milk allergy) and I was scared and immly stopped giving him. What are your thoughts on giving him kefir smoothie or do you think, I should try out some other way of introducing kefir. Did your son also react initially when you introduced the Milk-Keir cream cheese? Hi Devan, I would avoid any Milk Kefir that you can buy in the store. That stuff has at best about 3 strains of probiotic. The real Milk Kefir is hand-crafted and has like 20+ powerful probiotic strains. 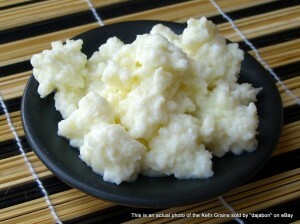 If this is something you are up for I am sure my wife and I could send you some Kefir Grains so you can make your own. We slowly increased the amount of Milk Kefir cheese and put in so much fruit juice that he didn’t notice. If you dissolve it well most kids won’t notice. Shoot me an email at my email address on the contact page if you are interested. in the Kefir Grains, my wife’s Kefir Grains are VERY highly rated on eBay, so you can trust them (of course, she will give them freely to a fellow parent like yourself). 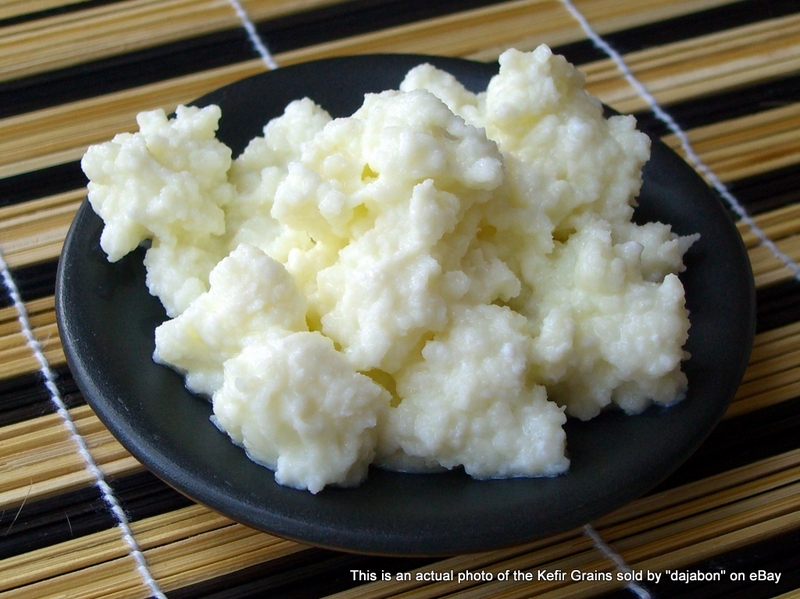 1) It would be wonderful if you could share the procedure to make kefir cheese. I have no clue so please provide the minutest of the details. 2) Also, if I want to make kefir milk using fresh grains, can I use the store bought milk? Hi Devan, I can’t believe how busy I have been, I apologize for my delay. 4) Pull the drawstring closed. Now wrap the top of the bag around the long-handled utensil as tightly as possible and hang the bag over the pot or large pitcher and place it gently in a refrigerator. 5) For the next 24-48 hours pour off the whey until very little is produced. You can pour the whey on outside plants, they will love it. BTW, you can use store bought milk. I suggest organic milk,we use Whole and 2% milk with our Kefir Grains. Avoid ultra-pasteurized milk if possible. I want to try this with my grandson who is 2. After you’ve made the kefir, you put it in the muslin bag. Then do you put it in the refrigerator for the next 24-48 hours while the whey separates and drips out? Hi Jean, Yes, you are 100% correct. Thank you for pointing out this fact, I will edit the original steps to include this for future visitors. Good luck with your Grandson. Our Lex has no trouble consuming other dairy at almost a normal amount for kids. Nevertheless, we do give him half of a chewable Lactaid when he has ice cream. Hi, I read your article with interest. Question: Our 4 year is allergic to milk, and we think its casein that he is allergic too. In your method, since you are filtering out the whey, aren’t you leaving all the casein there and isn’t that the primary source of milk protein allergy? Hi A.C., I think you are correct about the casein. Extracting the whey will reduce the lactose though. For the past 2 months, we have been giving Lex about 3 ounces of straight, unfiltered milk Kefir mixed with apple juice and water (and some KAL Crystal Calcium). This seems to be working VERY well for him (he is about 4.5 years old now). I’ve been giving my children home-cultured kefir for a couple of months now. My son is allergic to about 100 foods, so we’re trying to correct that. … my kids are 7 and 10, and drinking about 8 ounces of kefir almost daily right now. We usually make smoothies with blueberries. I was just told by doctor to start giving my 4 month old son kefir yogurt but only found the drinks he has bad reflux and colic will this help. Hi Jody, most Kefir Drinks found in stores are from the company “Lifeway”. They are considered by most to be very low quality milk kefir. Making your own is best, buying it from someone local is next best, but my wife tells me that Wholefoods super markets has some OK options as well.